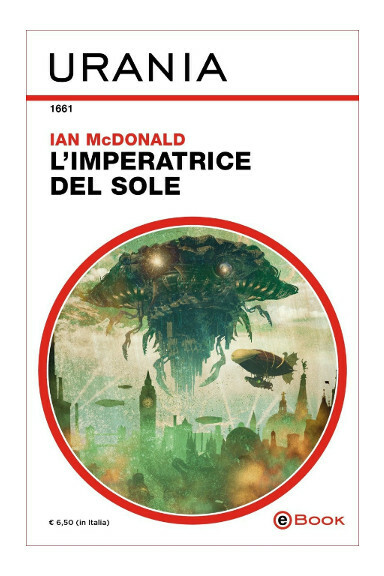 The novel “Empress of the Sun” by Ian McDonald was published for the first time in 2014. It’s the third book in the Everness series and follows “Be My Enemy“. After a jump into another universe, the airship Everness gets seriously damaged immediately after an arrival much more complicated than expected. Everett Singh tries to understand what went wrong since his calculations seemed correct and soon realizes that he and his fellow travelers didn’t end up on another Earth but on a Discworld built by the Jiju, very powerful and ferocious descendants of the dinosaurs. Empress of the Sun, the sovereign of one of the Jiju factions, would like to have the Infundibulum. Charlotte Villiers is aware that recovering the Infundibulum is no longer just a matter of personal power but of security for the human beings of all the Earths because they’d have no way to defend themselves from the Jiju if they could find a way to jump into parallel universes. Meanwhile, Everett M Singh struggles to pretend to be his doppelganger because of the difficulties in concealing his superhuman physical abilities and the consequences of his choices at the end of “Be My Enemy”. “Empress of the Sun” is the last part of a great story split into three books and begins where the second book ended so you must have already read the previous ones. Ian McDonald already described parallel universes that are very differet from the one the protagonist Everett Singh comes from, but the one in which the airship Everness arrives is really extreme given that it’s a Discworld. The author explicitly mentions Terry Pratchett and this can help especially younger readers who are the main target of the Everness series. Apart from the setting in different universes, the characteristics of “Empress of the Sun” are the same as the previous books with an adventure-oriented story. Ian McDonald is certainly not a hard science fiction author so the references to mathematics and quantum physics behind the jumps between parallel universes are really minimal. The author maintains the story linear even though this last novel is divided into three subplots that follow Everett Singh, his doppelganger and Charlotte Villiers. In “Empress of the Sun” the pace is still the generally fast one of the previous books and the threat to the characters comes especially from the Jiju. There are slower moments in the subplot that follows Everett M Singh where we see that this is a young adult series since the boy has to try to keep a low profile with a normal life between school, his doppelganger’s family and friends and some complications with a girl. In this book there’s a curious contrast at a distance between Everett, who is 100% human and lives an extraordinary adventure, and Everett M, who is a cyborg but tries to get into the normal life of a teenager. The mirror dance between the protagonist’s two versions was important in “Be My Enemy”, in the third book the two boys are separated but the differences between their reactions and the way they deal with the consequences of the events around them are still part of the plot. The protagonists were already developed in the previous novels but in “Empress of the Sun” Ian McDonald keeps on offering something new about them, about some members of the Everness crew revealing something of their past and about the two Everett Singh versions describing their reactions to the events they experience. Ending up in the Jiju universe with the consequent serious damage to the Everness is a blow to Everett Singh, who finds himself in a situation in which he feels guilty towards the crew with consequences on which he has very little control. In the Everness series, Ian McDonald doesn’t use many subtleties, unlike other novels targeted to an adult audience, but overall the quality seemed good to me. The ending is the part that left me more puzzled because once again it’s very open, as if the author expected to continue the series. Apart from this, I recommend reading the series particularly to young readers but can be enjoyed by the not so young ones as well.